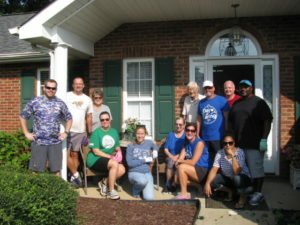 On Saturday, Aug. 26, United Way of Central Carolinas celebrated its 25th annual Day of Caring in Union County – a quarter century of neighbors helping neighbors. 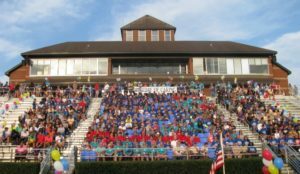 Teams from companies, schools, churches and civic groups – 138 teams in all – came together at Wingate University’s Irwin Belk Stadium for a 7:30 a.m. community rally and breakfast, then dispersed to Monroe, Indian Trail, Marshville, Unionville, Waxhaw, Wingate and other parts of the county to complete 132 service projects. Most involved outdoor work and home repair for elderly neighbors, such as pruning shrubs, cleaning gutters, window washing and trash pick-up. Dr. Bulla’s team had one of the more heartwarming assignments, helping 91- and 92-year-old Bonnie and Creed Smith of Indian Trail. Married for 72 years, the couple was nominated anonymously by a caring neighbor who knew they needed help maintaining their home. The Smiths didn’t know they’d be getting help until Dr. Bulla’s volunteers knocked on their door. Day of Caring has traditionally served as the launch event for United Way’s campaign season, but over the years, it has grown into a county-wide celebration of community, according to United Way’s Ivy Allen. Organizations with this year’s largest number of volunteers were Wingate University (348), Carolinas HeathCare System Union (215) and Union County Public Schools (108). Event sponsors were ATI Specialty Materials, BB&T, BNC Bank, Brewer-Hendley Oil Co., Carolinas HeathCare System Union, Charlotte Pipe & Foundry Plastics Division, Coca-Cola Bottling Company Consolidated, Commercial Piping & Fabricating Inc., Consolidated Metco Inc., First Citizens Bank, Goulston Technologies Inc., Hargett Electric Co., Perry, Bundy, Plyler & Long LLP, Piedmont Natural Gas, Potter & Company CPA, Robbins & Associates Insurance Agency Inc., RSC Chemical Solutions, State Utility Contractors Inc., The Enquirer Journal, Tyson Foods, Union County Chamber of Commerce, Union Power Cooperative, UTC Aerospace Systems and Wingate University. Dr. Bulla’s Day of Caring committee members were Renne Callinan, Marisa Ciesluk, Sheila Couick, Andrew Friend, Jennifer Kappas, Barbara Laney, Michelle Marcano, Robin Merry, Jessica Moree, Dale Morefield, Steve Ramsey, Chastity Richardson, David Sherwood, Linda Smosky and Rachel Sykes. United Way fights for the education, health and financial stability of every person in our region, improving lives by mobilizing the caring power of local communities in Charlotte/Mecklenburg, Mooresville/Lake Norman, and Anson, Cabarrus and Union counties. To get or give help, call 211 or visit uwcentralcarolinas.org.